Some Coach fans may like to carry around those telltale C covered handbags, but fashion is moving towards a more minimalist, less showy aesthetic. This pretty purse fits in with that perfectly. Without a signature print to distract us we can focus on the details. I love that rich pinky purple raspberry shade; it's girly but not incredibly sugary. I can just imagine the playful pop of color it'd bring to a neutral outfit. The V-shaped pleat is also stylish, as are the antique style brass buttons near the handles. Coach calls this a mini bag, but we all know size is a relative term in the fashion game. While it's smaller than the average day bag, I don't think it's quite as pint-sized as that name would lead us to believe. With some careful packing I think everything we really need could fit inside it, and with style like this it might be worth the effort. I'm sure many minimalists out there will be tempted by this Coach offering, particularly when they spot its relatively reasonable $198 price tag. 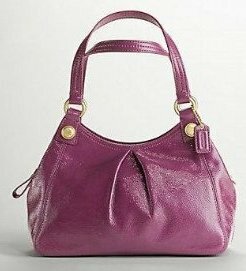 The large Coach Mia Maggie bag, a great alternative to this mini bag.